The actor talks about his serendipitous role in David Gordon Green’s elegiac dramedy. Time Out spoke with the actor over the phone the week before the film’s release. Time Out: Did David Gordon Green approach you for this project or did you pursue him? Emile Hirsch: It was actually kind of serendipitous how the project came about. I’d been working on my own script that was basically a one-room movie. I called up David to ask him questions about microbudget productions. We’ve known each other for eight or nine years; we were supposed to do this movie called Goat together and it never happened. It seemed like an appropriate occasion to hit him up, and we hadn’t spoken in a while. He answered all my questions very nicely, and then two days later, he called me back and said that because of our conversation, I’d gotten into his head about this project. So it was incredibly good timing on my part. 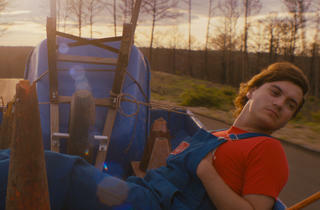 Time Out: Did you watch the original Icelandic film, Either Way, before you started working on Prince Avalanche? Emile Hirsch: No, I avoided it, because it’s very easy to start second-guessing performance choices. I think sometimes when people do a remake they purposely go in an opposite direction, and they fail because you’re not really supposed to go that way. Whereas if you don’t expose yourself to the original source while working on a remake, you might go in the exact same direction as the previous actors—but maybe that’s because you should be going in the exact same direction. That’s what the instinct of the character dictates, so you naturally come to that conclusion. Time Out: What was the tone you worked to achieve with the material, and what’s your take on the relationship between Alvin and Lance? Emile Hirsch: I wanted it to be a drama about people who were inherently funny. I have a lot of people in my life who are truly ridiculous characters, and they’re very, very funny people, but they don’t really try to be. They’re not cracking jokes. A lot of the things I find funniest about people are their shortcomings that they’re oblivious to, but that they’re constantly reminding everyone around them of. As far as Alvin and Lance: I think that Lance sees things in Alvin that Alvin doesn’t see about himself, such as the inadequacies of his relationship with Lance’s sister. Lance knows right off the bat that Alvin’s failing being a man in a very fundamental way. So when Alvin starts quibbling about all the things Lance does wrong, Lance just sees right through to the hypocrisy. Time Out: Cinematographer Tim Orr is such an essential part of David Gordon Green’s films. Did you shape your performance with him in any way? Emile Hirsch: Tim and I are very close. We worked on this movie called Imaginary Heroes (2004), and we’re like old friends; I trust him because I worked with him when I was young, so I have that kind of attachment to him. I think that’s really good for an actor—to like the people behind the scenes—because then you treat the camera differently. If you really like someone who’s shooting you, you’re more open. You’re not defensive, you’re more relaxed, and I think that translates into a more interesting, natural performance. Time Out: I have to ask you about the song “Bad Connection,” which you and Paul Rudd perform. You wrote it yourselves, didn’t you? Emile Hirsch: Yeah. Both Paul and I like improvisation. That was something where we just started singing on the spot and kept going and going. We had the theme, but it just evolved into this song, and the way David interwove it with the score by Explosions in the Sky, even fading pieces of the song in and out at times, was just really splendid. Time Out: One of the other major cast members is the late Lance LeGault, who plays a truck driver that Alvin and Lance cross paths with several times. He had quite a storied career as a stunt double for Elvis Presley and as a character actor in films like Stripes (1981) and Iron Eagle (1986). How was it working with him? Emile Hirsch: Lance was such a badass. He’d get on set, and he’d have his oxygen tank by his side and his pipe in his hand. He had a really loud, brash way of speaking that was so addictive and smart and really colorful. He’d tell me stories about getting laid right and left while being with Elvis in Vegas. His descriptions were so forward and crazy. And his wife was right in front of him! I was almost checking her hands to make sure they weren’t right near the oxygen tank shutting off the gauges. [Laughs] But she loved him. That’s just who Lance was. He was a beast and a half. Time Out: Let’s talk a bit about your own career path. Aside from David Gordon Green, you’ve worked with a lot of interesting people, like William Friedkin, Oliver Stone, Sean Penn, the Wachowskis. How conscious are your job choices? Emile Hirsch: People always ask me about career choices, though it rarely ever seems like any kind of choice. It’s just like, I really want to do something, this is what I can do now, and that’s it. I’m lucky to be doing this at all. Most actors are lucky to ever get a job, period. I never forget that, because I have so many actor friends in L.A., and most of us barely ever work. And those of us that do, it’s still only 60 days out of the year that we’re actually on camera. It’s an absurdly low number. Ultimately, it’s not necessarily about career choices. It’s more of a path that I see ahead of me. I don’t say no a lot. I’m sort of like a rat in a maze—I’m moving forward, and any choice I make at the time seems like the only one I can make. Prince Avalanche is playing now in Los Angeles.